With the aim of ending the social stigma about HIV, a German magazine has been printed with ink infused with HIV-positive blood. 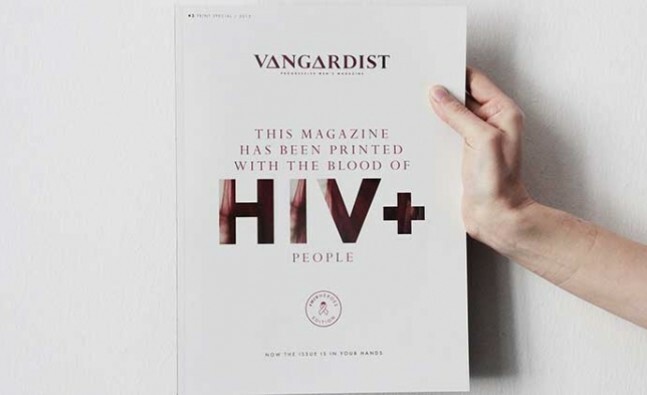 Saatchi & Saatchi Switzerland, in partnership with Vangardist magazine, a leading German men’s monthly, has invited its readers to take a hands-on approach to end the social stigma surrounding HIV by printing a special edition using ink infused with HIV-positive blood. The magazine, which has been produced to coincide with one of the biggest annual AIDS charity events in the world, Life Ball – which takes place at Vienna City Hall on the 16th of May in Vangardist’s home town of Vienna – aims to help affected people in an unconventional way and to fight against the taboo status of HIV/AIDS in society. While the magazine has been produced according to the most stringent controls and using processes developed according to guidelines established by Harvard and Innsbruck University, ensuring that the handling of a physical copy of the magazines carries no risk of infection, and is 100 percent safe; the debate and discussion around the magazine and the issue it highlights has already been significant. “This is truly a ‘nothing is impossible’ story – one we have been passionate about for a long time,” explained Jason Romeyko, Executive Creative Director of Saatchi & Saatchi Switzerland. With NGOs and governments alike all acknowledging that the social stigma surrounding the disease remains one of the key factors preventing effective management, and ultimately the eradication of the virus, Vangardist believes it is essential that conversations around this topic are reignited. “This felt like a very relevant issue for us to focus on not just editorially but also from a broader communications stand point,” he says. The magazine has been available to subscribers from the 28th April, and will be on news stands and online from this week. In addition, the Facebook page aims to be one of the most widely visited and ‘liked’ HIV-related pages on Facebook, demonstrating to the world that a community of people for whom the HIV virus carries no social stigma exists.